Lois Willis has published a blog post about her Mulder ancestors in South Yarra, Victoria, Australia, whom she traced back to a Jacob Mulder in Amsterdam, The Netherlands. I decided to take a look at this Jacob Mulder. 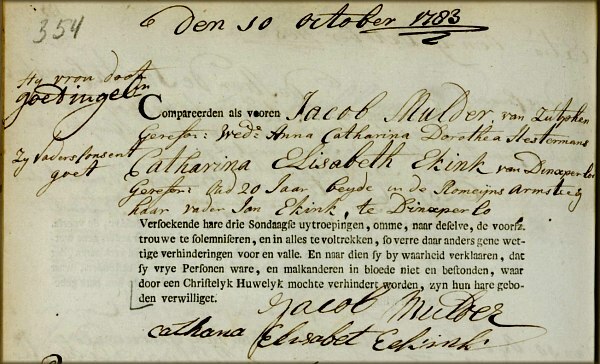 The blog post enumerates Jacob Mulder's 9 children from his marriage to Catharina Elisabeth Ekink. I searched for their marriage enrollment at the website of Amsterdam's Archive. I couldn't find the marriage in the Marriage & Burrial Records, but I did find their notice of marriage of October 10, 1783, in Amsterdam. The records revealed interesting addition info: Jacob Mulder originated in Zutphen in the eastern part of The Netherlands and was a widower. His first wife was Anna Catharina Dorothea Hestermans. Jacob had given the Christian name of his first wife to his eldest daughter with his second wife. His bride, Catharina Elisabeth Ekink, originated from Dinxperlo, a village near the German border. Her father is Jan Ekink. The document also contains Jacob's signature. The notice of marriage for Jacob's first marriage was on November 10, 1775, in Amsterdam, when Jacob was 25 years old. It mentions the presence of his father, another Jacob Mulder. The bride, Anna Catharina Dorothea Hestermans, was 34 years old, and both her parents were dead. 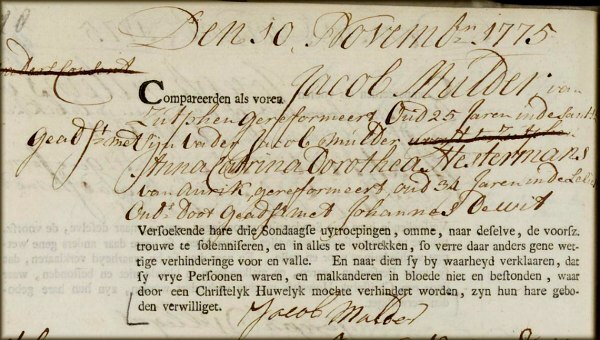 I was able to find one daughter from Jacob's first marriage: Sophia Dorothea Mulder was baptized on May 19, 1779, in the Zuiderkerk church in Amsterdam. Jacob's surname is derived from a typical Dutch occupation: miller. 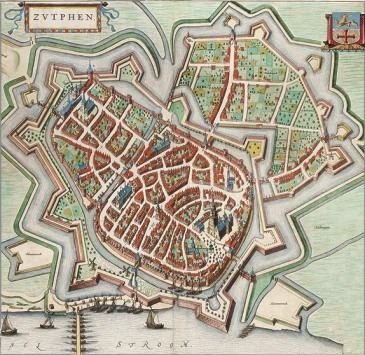 His father's Christian name was Jacob, too, and Jacob jr. was born around 1750 in - or nearby - Zutphen. 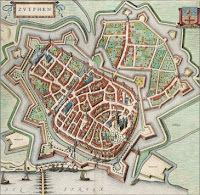 A lot of genealogical sources relating to the city of Zutphen (see the old city map below) are available on the Internet for further investigation. Sources: Archief Amsterdam Website & Lois Willis Blog.